This THP is about 5 miles north of I-80, and about 9 miles NE of Grass Valley at an elevation of 3200 to 4580 feet. 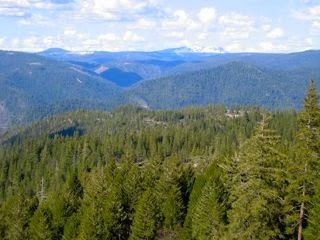 Sierra Pacific Industries is planning a tractor and cable logging operation in mixed conifer forests on steep and unstable soils. SPI is claiming the need for 893 acres of sanitation salvage logging due to the presence of fir engraving beetles, true fir canker, white fir dwarf mistletoe, western gall rust and red ring rot. There are 15 springs and 9 seeps, and 1 unstable area in section 21 adjacent to a road. Ground based equipment is proposed for use on slopes over 50% with a high erosion hazard in 2 places in section 1, and an existing skid road is proposed for use on a slope over 50% grade that does not flatten before reaching a class II watercourse. Two existing landings are also proposed for use partially inside a class I and class II watercourse. Osprey nests and sightings were reported within .53 mi of THP units in section 21 on USFS property, and ringtails were seen in sections 10 and 21. Humboldt Lily was also reported to be in section 9. More information is available on the THP Tracking Center website.